I have been forgetting to bring my camera along with me during the weekends, which means I don't have pretty photos to show of this new, quaint little place I've found. All photos in this post were taken with my iPhone. This cafe is pretty near to our place, and a stone's throw away from our church. I picked Wimbly Lu as a place for tea with a few friends because I couldn't bear driving into town for tea on a Saturday afternoon (the crowds!) and frankly, just couldn't think of any other place. This place opened very recently - this month or last, I think! 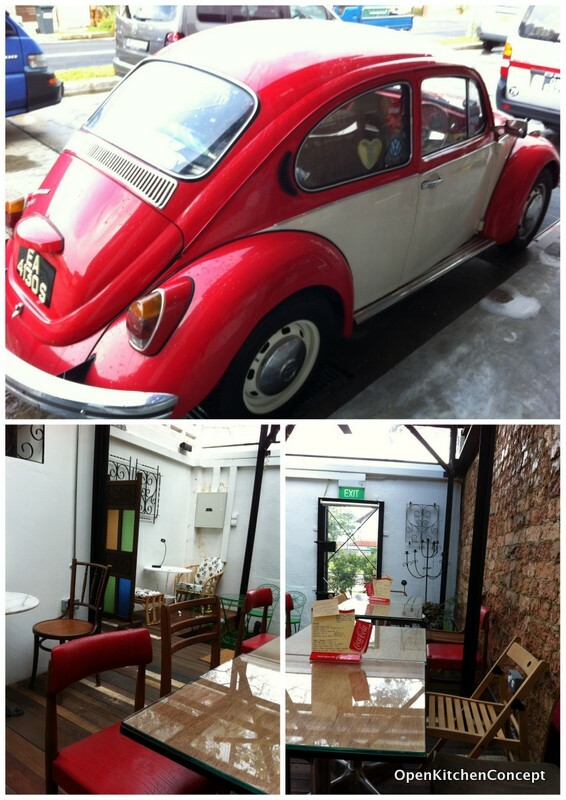 You can't miss the cafe, with its signature red-and-white vintage Beetle outside! This cafe specialises in chocolates and what I like about it is that it is really very homey - mismatch chairs, extremely old decking, beautiful-but-mismatch plates, red brick walls, glass ceilings that lets in lots of lights and lets you see the rain. It's the kind of place you know you can be comfortable in with a few good friends for the afternoon. The drinks at Wimbly Lu were nothing to shout about. The desserts were all pretty good though. The black-out cake my friend ordered looked dry but it was very moist and not-too-sweet. The slice of cake was a real tiny one though. The Husband was very put of by it as he believes that you should always cut 1/8th of the cake to serve. "You can charge more but you can't give less" - is something he strongly believes in. The Husband ordered Eton Mess, something we have never seen in a menu in Singapore. I thought it would be overwhelmingly sweet but I must say it was really quite good. I'm really impressed with the meringue - crispy on the outside with a marshmellowy center, yet not too sweet at all! The meringue went perfectly well with the whipped cream and very tart raspberry sauce. I ordered the waffles with homemade chocolate truffle ice-cream and chocolate sauce, based on recommendations from this blog. I have been having cravings for waffles of late and this was the ANSWER to my cravings. The waffle is pretty light and crispy, not unlike the ones you get at A&W in Batam, but slightly more substantial. The homemade ice-cream looked rather melted and unappetizing but it was surprisingly rich and good! Good waffles - I'm so glad this place is near my home! The homemade truffles at Wimbly Lu were good too. Not particularly pretty and refined looking but they tasted good, which is what is important at the end of the day. I tried a few flavours and my favourites are the dark chocolate and baileys truffles. They serve good-old root beer float too! Yups. They actually approached me when they were still in the company (and after I've been bringing dinner for my partner for ages, lol) asking where to get plants. Of course it's World Farm! LOL. And LOL. That sounds quite amusing. Were there a lot of people there at that time? I obviously can't get there to try the cafe at the moment but certainly like the beetle!